Unionville's Alison Lewis driving for a layup for two of her 10 first quarter points against West Chester East, Saturday. EAST MARLBOROUGH —Yogi Berra said famously, “it’s not over until it’s over.” Well, just eight minutes into Saturday night’s Unionville High School girls basketball game against West Chester East, it was pretty much over. The Indians (12-8) ran out to quick lead, as freshman Alison Lewis scored 10 points in the first quarter — out of her game-high 16 — and they never looked back, building up a 37-12 lead by the half. Although there were some concerns about whether the odd start time might throw off Unionville, it was was pretty clear from the quick start there were no issues. In addition to Lews’ 16 points, Cami Redfern added 15, with five three-pointers. Moira McEvoy had nine points. Susie Pancoast and Jill Murray contributed six each. 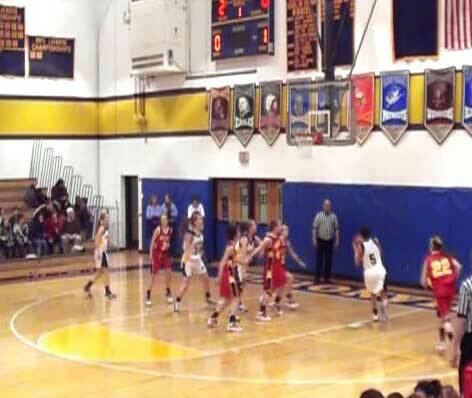 Unionville improved its overall record to 12-8 with the non league win over East. Chester visits Unionville on Tuesday night. On Thursday, a home battle versus neighboring rival Kennett, the team will celebrate senior night.